Many people believe house call physicians are a relic of an earlier, simpler era. While this is for the most part true, Michael Farzam MD at House Call Doctor Los Angeles is proud to still provide clients with the urgent care Venice residents and others throughout L.A. have come to rely on. In 2001, Dr. Farzam completed his medical school training and received his Physician and Surgeon's medical license from Tufts University School of Medicine in Boston, MA. 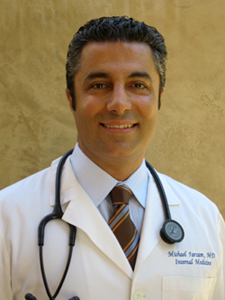 As a board certified doctor in General Internal Medicine by the American Board of Internal Medicine, Dr. Farzam is highly skilled at providing necessary urgent care in Venice and throughout the greater L.A. area. However, it is his reputation as a concierge doctor who meets patients directly at their door that makes Dr. Farzam truly stand out from the competition. The acclaimed medical professional provides 24 hour urgent care to one's home, hotel or worksite, ensuring that he can provide the urgent care Venice residents need most – when they need it. In the traditional, modern health care model, doctors have to see more and more patients to meet their overheard and remain sustainable. By visiting patients in their homes, though, Dr. Farzam is able to cut down dramatically on overhead costs, allowing him to focus more individual attention on each patient his treats. For urgent care, Venice residents deserve nothing less than the best, and with House Call Doctor Los Angeles Dr. Farzam, they receive precisely that. Perhaps best of all for many, Dr. Farzam's house call practice ensures a more earth-friendly, eco-conscious healthcare experience, with less waste and less travel required by patients. Whether you're in need of concierge nurse care, illness care, house calls, physicals, or many other treatments, always remember you can count on Dr. Farzam to provide these services from the comfort of your own home.